I think this is one of my favorite interviews yet! In the following conversation, Dr. Matt Harris talks about how President Kimball persuaded the apostles to lift the priesthood and temple ban on black church members. It turns out the Brazil Temple was a key part of that, as well as Bruce R. McConkie’s change of heart. Matt: Kimball knows the consequences of doing something unilaterally without quorum buy-in. He sees that in church history, and he experiences it himself during the McKay administration. So, President Kimball recognizes this is such a delicate task, and that if he is going to make this, arguably, probably the most momentous—not arguably. In the 20th century, it is the most momentous decision in the church, second maybe only to plural marriage, giving black people the priesthood. Dr. Matt Harris has uncovered that apostle Bruce R. McConkie wrote Official Declaration 2, which allowed for the first time in 120 years, open ordination of black church men, and allowed blacks access to the LDS Temple ordinances. This may seem especially ironic, given the fact that McConkie had long justified the ban through the Curse of Cain and Curse of Ham in his book, Mormon Doctrine. Matt: President Kimball knows what he is doing. He needs to get Elder McConkie’s buy-in. When he gets Elder McConkie’s buy-in that the ban needs to be lifted, I mean he feels that there is a tremendous weight off his shoulders. This isn’t to take away of course any of the spiritual aspects of the temple and the revelation, and the things that the apostles will recount afterwards about it being the most magnificent spiritual experience of their life. I think that’s all very authentic and genuine, but it just speaks to President Kimball’s remarkable leadership, that I order to do this, “I’ve got to really work with my associates and massage them and help them to understand that this is the right thing to do.” To me that is an incredible, remarkable exercise in leadership on President Kimball’s part, because he doesn’t want to create a schism in the Twelve like President Woodruff had under his leadership. I am sure as the church president that President Kimball could have just done something unilaterally. But if there is no buy-in, what is the point? Right? If people don’t realize that this is the right thing to do, that’s really one of the most remarkable things is that he gets the buy-in from Elder McConkie. Not only is there buy-in from Elder McConkie, the biggest doctrinal hardliner, but it is Elder McConkie who writes the Second Official Manifesto that will be added to the Doctrine & Covenants. That is his language. We will also discuss a candid discussion between President Kimball and an official from the Ford Administration, who expressed displeasure with the ban. He said, “President, don’t you get it? President Kimball, without missing a beat, says, “We’ve got to change this policy, but I can’t. I am worried. I am worried about how the saints in the South will take this policy.” It’s the same thing McKay had to deal with, you remember? “I am worried about my brethren in the Twelve.” That’s what he said. I would also like to thank Todd, one of my listeners for inviting me to the “Be One” celebration on Friday at the Conference Center. The music was AMAZING, and this was one of the coolest church services I have ever attended. The music and messages were truly inspirational, and I found myself a bit emotional. If you haven’t seen it, here is a video. Skip the first hour of countdown. Gladys Knight, her choir, the Bonner Family, and the rest of the performers and speakers were truly amazing. Truly it was a spiritual feast! What are your thoughts on the end of the ban? Elder McConkie, and other members of the Twelve, supported lifting the Ban because of a powerful manifestation of the Spirit. End of story. They experienced a Day of Pentecost like manifestation. RickB., Thanks for the post and the link. I missed the “Be One” celebration — couldn’t face the reminder of how long it took to get to lifting the ban. I’ve heard and read good things about it. BTW, if that was “one of the coolest church services [you] have ever attended,” what can be done to bring that feeling into sacrament meetings? I hadn’t realized that anyone took it for a church service. Aren’t church services supposed to be staid and boring — and certainly without any sinful applause!? Jared, I’m always amused by “end of story” statements. They sometimes seem to imply that the beginning and middle of the story were irrelevant or unnecessary. Would there have been such a spiritual manifestation without preparation — including the things that opened hearts to it, such as SWK’s request to BRM for a memo on the ban and BRM’s conclusion that there was no scriptural impediment to changing it, or the consciousness of the pain and problems posed by church growth in and plans for a temple in Brazil, among other things? So Pres. Kimball privately acknowledged (in so many words) that the persistence of the Ban was due to the racist views of the membership (which is likely a projection of the racist views of the leadership onto the membership) rather than any divine input. Ultimately, the problem is not a single doctrine, it is the flawed model and methods of church governance that have become entrenched in the Church. I’ve got mixed emotions around all of this. First, I think it’s true, as Bellamy points out, that there was no grand spiritual manifestation. I think that’s problematic on a number of levels, not the least of which is God appears to allow people to be racists and enact real, demonstrable harm to others, even in the “one true church”. Perhaps the Mormon God so values agency and free will that even in pretty dire circumstances, he won’t directly intervene. Fair enough, I suppose, but I do think we need to tell the story straight, as Bellamy suggests: A bunch of people, probably due to, among other things, a good deal of cultural pressure, get together and decide on their own to end the ban and it’s an absence of “No” from God, not an affirming “Yes” that leads them to think it’s okay to lift the ban. That’s what appears to have happened and we need to tell the truth about it, regardless of whether it makes some TBMs uncomfortable. Regarding the celebration, it’s not my place or my job to tell others how to feel about the ban and its lifting and the church’s celebration of it. I can say that it made me rather uncomfortable, especially when I heard the rhetoric of inclusion and love for all, etc. and all I could think was: “So women should have the priesthood, then, right?” and “So when are we going to start treating our gay brothers and sisters as equals?” Also, I found the pageantry of it all really kind of tone deaf. I think I know what the celebration was trying to do and I applaud the impulse, I suppose, but to me it really just called even more attention to the racist assumptions behind the ban. Like I couldn’t figure out why the church would want to celebrate/call attention to how behind the curve it was in terms of when the ban was lifted. For an institution with its own media company and hopefully some fairly competent public relations people, a lot of what we do strikes me as remarkably tone deaf. It just seemed at times a bit more like propaganda than pageantry, though the music was grand. But as a caveat, I’ve spent a fair amount of my adult life studying Elizabethan politics and so I’m probably more inclined to be skeptical about pageantry and its co-opting by people in power who are invested in sending a definite, specific message. Brother Sky, from what I’ve read, it seems that the Be One celebration was the brainchild of several black Mormon women. They informed the Brethren that they were going to do it with or without their support, and the Brethren decided to support them. That “committee” seated at the front at the beginning of the program planned the whole thing, except for the words of President Oaks and President Nelson. I loved it and I’m so glad that they did it. Autumn, thanks for the additional information. Still not a big fan of the pageant, but this adds some helpful and nuanced context. Jared, I have the Special Limited Edition” copy of “Lengthen Your Stride”, (LYS) by Ed Kimball. It contains extra information than the regular public version of LYS, and adds this on page 608. 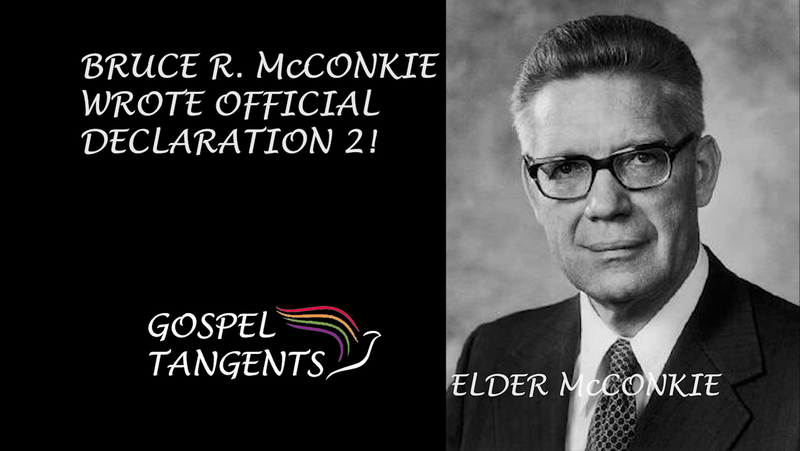 Bruce R. McConkie described the climatic events of June 1978, confirming the decision to extend priesthood to all worthy men. He had written “We all the same voice, received the same message.” This language upset Spencer, since it might give the impression that everyone in the meeting heard the voice of God audibly. He asked Ed to speak to Elder McConkie about changing the text to avoid any possibility of misinterpretation. Spencer had no doubt about the reality of the revelation. “It did happen,” he said, with an energy that belied his frailty. What occurred did not need exaggeration. I dunno. I attended the Genesis Group on Sunday, and there was lots of singing and clapping. Perhaps we need to put Darius Gray in as an apostle, but I don’t get to make that call. MH Thanks for the quote. Bellamy-do you know if Elder Richards ever gave a testimony expressing if he felt a manifestation of the Spirit? I would think there is a collection of testimonies given by all who were present that day in June 1978. Does anyone know where such a collection exist? MH-wonderful post! That is what I was looking for. I hope everyone who reads this post will read Mormon Heretic’s post. The link is above in his comment. In Australia there is no mention of a celebration of 1978. It was certainly seen as doctrine here, and questioning was not acceptable. I’m sure many members feel that the discrimination against non hetrosexuals is also doctrine. Many members here believe the first presidency meet regularly with the Saviour, who tells them what he wants done. So there is no need to be concerned about change, because when Christ wants it he will say so. The process above is very different. The Prophet, after he overcomes his racism, and is convinced the Lord wants change, doesn’t come out and say so, but is concerned most of the 12 agree. Was it intentional to wait for Mark Peterson to be away? Were the saints in Utah aware of any of this All happening? Are similar processes happening about our ongoing discrimination against women, and gays? It would be good to know. Your comment is welcome and important. As I understand your position, we are miles apart. That’s OK. We have agency. Was the 1978 revelation real or a shame? I accept it as revelation. President Kimball approached the Lord in mighty prayer. Wrestling with the Lord in prayer is at times required to obtain revelation according to the Book of Mormon. President Kimball , along with prayer, used all the means available to him to accomplish what needed to be done so the church could progress in South America and the rest of the world. We have the testimonies of those who were present. They make it clear it was revelation, not just a routine change. We get to decide if we believe Mormon prophets are the real thing or just another group of men making decisions. As prophets they are in contact with Jesus Christ. He is the one who answered President Kimball’s pleadings. It seems to me Pres Kimball wrestled with the Twelve more than he wrestled with the Lord.